For anyone that isn't a developer, the second keynote during Microsoft's Build 2015 conference was a bit of a snoozer. 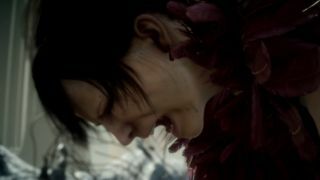 But Square Enix, the game studio behind the acclaimed Final Fantasy series, swooped in to save the day with a stunning game demo using DirectX 12. Don't be surprised if you're forced to do a double take upon watching this demo or looking at these screenshots – I did exactly that. Once the video, titled simply "Witch: Chapter 0 [Cry]," was through, Microsoft Corporate VP and Chief Evangelist Scott Guggenheimer took direct control to show that these graphics were not pre-rendered but served up in real time. Simply put, it's jaw-dropping how realistic these visuals look – Square Enix is quickly approaching Uncanny Valley territory here. From the texture of the woman's skin to how her tears refract the light on her face, what DirectX 12 can do is already stunning. DirectX 12, referred to often as "DX12", is the Redmond, Wash. firm's latest collection of gaming APIs, or application programming interfaces. In short, this is one of the many tools that PC game developers use to make their games, directly dictating how those games look through what it offers. Based on what was shown off today on the Build stage, DX12 offers game creators quite a lot. "Each of these scenes is over 63 million polygons," Microsoft Technical Fellow John Shewchuk said during Guggenheimer's live run-through of the demo. "That's about six to 12 times more than we could do with DX11." "Just to give you an idea on the textures that you're seeing here," Shewchuk continued, "those are 8K by 8K textures. Again, significantly more than we were able to do [before]." If those numbers sound like nonsense to you, that's because the demo was running on a Digital Storm gaming PC with four Nvidia Titan-grade graphics cards working together. "I think where it gets really interesting, though is – look at the hair," Shewchuk said. "Every piece of hair that you're seeing is being rendered as a polygon. This isn't surface map stuff. And as those polygons are running through the pipeline, they're running over 50 different shaders to generate that level of clarity on this." Of course, keep in mind that this demo doesn't consider even half of the graphical elements that a game released to the public would have to. You can clearly see in some scenes that the "63 million polygons" are confined to a pretty small surface area. So, I wouldn't expect the next Final Fantasy game to look exactly this good on PC, but it should be mighty close.